Take in the morning breeze and enjoy the peace and stillness of the pagoda, which holds religious importance to the local community. Here, your guide will tell you more about religion in Cambodia, as well as the local cultural practices connected to it. Visit one of Siem Reap’s most famous pagodas for a behind the scenes look at the lives of Buddhist monks. Your private guide will unlock the mystery and meaning of this unique experience, which includes prayers, chanting and even a traditional Buddhist blessing. Travelers can volunteer to participate in age-old ceremonies that take place amid burning incense and flower offerings. Everyone will leave with a thin red thread wrapped around the wrist that symbolizes prosperity and good luck. Guides customize the tour to individual interests and schedules and round-trip transportation is included. Meet your guide at your Siem Reap hotel and spend the afternoon experiencing the beauty and intimacy of your own private ceremony at a renowned Buddhist temple. You’ll venture to Wat Athvea as part of this Buddhist Blessing Ceremony and Pagoda Tour. Follow your guide through stunning temple grounds, where you’ll see ornate carvings, well-kept gardens and golden spires. Temples date back as far as the 15th century and offer a window into ancient Buddhist traditions. You’ll take a seat on the floor once inside the pagoda and watch as Buddhist monks in saffron colored robes chant prayers in Pali, a language that dates back to the earliest Buddhist spiritual writings. You’ll have the chance to offer alms—like jasmine flowers—as candles burn and richly scented incense drifts through the air. The ceremony last approximately 30 minutes and travelers can choose to participate as they wish. Monks will bestow personal blessings as they tie red threads around wrists to symbolize prosperity and attract good luck. 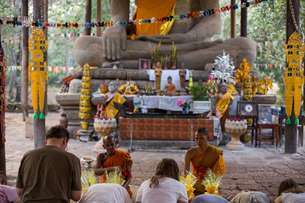 Your professional guide will also serve as interpreter, and can translate to help you better understand the role of Buddhism in Cambodia. This private tour is customized to your desires and interests, so explore the grounds at your leisure before returning to your hotel.